This month, Travel Poet and circle practitioner Kristie McLean shares four thoughtful, important considerations for using circle in international humanitarian work. In the geographic region of my Obstetric Fistula project, Muslim men are allowed to take up to five wives. While this practice challenges some of my personal beliefs around respect toward women, I’ve had heartfelt conversations with local men who struggle with a sick or dying wife and who still need the tactical support of a healthy woman to help with the collection of water, cooking and childcare so that the family can physically survive. Setting aside stereotypes and being willing to discern the intention and core needs behind different practices has proven helpful. As a white foreigner constantly bumping up against privilege and power, I do what I can to demonstrate equality and care for whomever I’m working with. Since I’ve known many of the fistula patients for years and am not bothered by their physical condition, I struggle with the local practice of being served most of my meals in a separate location. After trying to insist on more shared time and meals I was gently told by a staff member that the women also need time to decompress and to clean their garments without the shame of doing so in the presence of a farangi. Since then, I’ve been more mindful about whose needs I’m trying to serve. I often hear well-intentioned travelers talk about their desire to bring candy, chewing gum or pens into rural countries, often in Africa. The rationale is that local people “have so little” and that the traveler wants to help. Unfortunately, the unanticipated impact of such gestures can lead to a local perception of white people as ATMS, cravings for sweets, candy wrappers and plastic causing litter, and children (and adults) fighting over pens or trinkets. Where local communities were previously wired to share resources and help one another, they can quickly become competitive, aggressive and scarcity-based. I try hard to limit what I bring into foreign places. 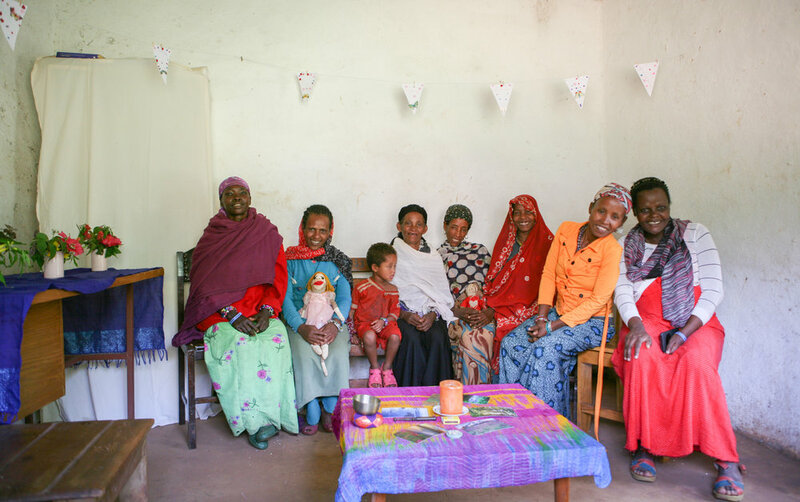 In Ethiopia, small solar powered “Luci” lanterns can provide safety for women traveling to and from water holes at night or tending to animals. I’ve also brought re-usable, washable menstrual kits as samples and then have worked with a local tailor to replicate the product locally as an income generation activity. I bring the same bell and often the same fabric for the center of the circle and take care not to wear more than two or three different outfits. Most of the women with whom I work live in poverty, and some have no more than one dress. It feels important to live as simply as possible and to limit the perception and division of wealth. Sometimes a check-in can last several hours, especially if circle participants have not seen each other for years, there are significant life updates and the circle is unfolding in an oral, agrarian culture. It doesn’t always work to invite a SHORT check-in question and to try to tell people that they can share more later. Allow people to share what’s most alive and re-shape the agenda as it flows. Certain games and activities do not always turn out as intended. I tried introducing a game I learned through Alternatives to Violence Project where participants stand in a circle and one person leads the group through changing hand and body movements and an “it” person tries to guess the leader. Despite multiple attempts at this game, it fell completely flat. I felt frustrated until I observed the simple joy everyone had in following along and mimicking different motions like snapping, tapping a foot, turning in a circle, patting one’s belly. While this simplistic version didn’t carry the same weight or kind of active attention I’d hoped for, it created delight and complete engagement. The levity it produced was also truly needed to provide a break from a lot of heavy, serious and often tragic content. I’m aware that physical touch can be charged and hold different meanings for individuals with a variety of backgrounds and across various cultures. I’m also keenly observant of how physicality can provide comfort and support beyond words, especially among populations who are shunned by society and often isolated and lonely. When a fistula patient leans against me or puts her arm on my waist I’m careful to smile and acknowledge the vulnerability it can take for her to reach out for human contact. I’ve also observed the power shift when I choose to stand or sit next to someone who is being ostracized in some way by the group. The simple act of presence can bring that person back into stronger footing within the community and circle. While I have core values around equality and fairness, occasionally a circumstance arises where I have a sense that a particular action is needed for one person. Toward the end of this last trip to Ethiopia, after the formal end of our circle time, a conversation with one of the fistula patients and her new husband and a BGS staff and me ensued. Pragmatically speaking, the conversation was geared toward the new husband, where he was thanked for his support of Ayalu and also put on notice that she had allies to make sure she would be appropriately treated going forward. There was some clarity and fierceness to the conversation and some heft behind it. I was willing to put some donor money behind a new house for the couple as long as the situation was healthy and caring for Ayalu. In every part of the conversation, Mahamed seemed to be loving, patient and receptive to feedback. Suddenly I felt called to stand up, move the candle and bell and neatly fold up the beautiful purple fabric with the silver thread running through it. I handed it to the Ayalu and Mahamed and told them it could be the first gift for their new home and life together. That spontaneous gesture elicited shock, tears, warm hugs and some small ceremony that became possible simply by listening, honoring and paying attention. Kristie McLean is a circle practitioner, coach, documentary photographer and writer who creates safe sanctuary, deep taproots and beauty within challenging environments and communities who are largely overlooked. She is actively engaged in hosting work (The Circle Way, Non-Violent Communication, Emotional and Cultural intelligence, Appreciative Inquiry and multimedia storytelling) with the Washington State prison population and with Obstetric Fistula patients in Ethiopia. Her passion for building bridges between complex social and humanitarian issues and sustainable, transformational change has led her to more than 50 countries on 6 continents. Older PostTips: hosting and facilitation – is there a difference?